Martha E. (Frump) Robinson, 93, went to be with the Lord November 26, 2018 at Crestwood Ridge Nursing home in Hillsboro, Ohio. She was born October 4, 1925 to Jesse and Bess Frump in the Marshall township where she resided most of her life. She attended Marshall School and was a life long member of the Marshall Church of Christ. 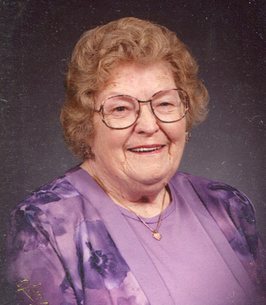 She loved teaching children’s Sunday school to many little boys and girls over the years. While raising three children she also worked at Robert Shaw in Hillsboro. Besides her parents preceding her in death was her husband Hurstel Robinson, her sister Norma Bick, a grandson Jesse D. Robinson and brothers-in-law and sisters-in-law. Surviving her are her 3 children, Verlin (Geraldine) Robinson of Alabama, Jerry (Nancy) Robinson of Marshall and Patricia Jeffries of New Vienna, 6 grandchildren, Robert Robinson, Melinda (Frank) Frech, Randolph (Cora) Robinson, Joseph (Gail) Robinson, David (Peggy) Jeffries Jr., Amy (Tony) Barber and many great grandchildren. Services will be conducted by Thompson Funeral Home November 30, 2018 at 1:00 P.M. Burial will follow at Prospect Cemetery. Visitation will be 11:00 A.M. to 1:00 P.M. November 30, 2018 at Thompson Funeral Home. In lieu of flowers donations can be made to Hospice of Hope or to research for Alzheimer’s disease. To send flowers to the family of Martha E. Robinson, please visit our Heartfelt Sympathies Store.